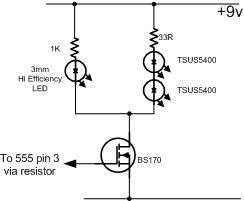 An Infra Red wired Repeater circuit to control appliances from a remote location. The signal emitted by an IR remote control contains two parts, the control pulses and a modulated carrier wave. The control pulses are used to modulate the carrier, a popular modulation frequency being 36 and 42KHz. The signal is radiated by an IR diode, typical wavelengths in the 850 and 950 nm region of the electromagnetic spectrum. Although this light is invisible to the human eye, it can be seen as a bright spot with a camcorder or digital camera. In this circuit, the TSOP1738 IR module removes the carrier leaving only the slower control pulses ( 1 - 3KHz) which appear at the output. R1, C1 and Z1 form a smoothed 5 Volt supply for the IR module. Under quiescent conditions (no input signal) the output of the IR module is high. Transistor Q1 will be on, resulting in a low collector voltage, restting the 555 oscillator. Q1 also acts as a level shifter, converting the 5 Volt output signal to 12 Volts for the 555 timer. When an IR signal is received, decoded control pulses turn Q1 off and on. Each time Q1 turns off, pin 4 of the 555 timer goes high and an oscillation will be produced for the duration of each data pulse. As the timing is crucialthe capacitor should have a tolerance of 5% or better and the power supply should be regulated. To allow for tolerance in components a 4k7 preset resistor is wired in series with R4. This adjustment allows R4 to be 15k to 19.7K creating output pulses of 21us and 27.58 us. As frequency is the reciprocal of periodic time then the oscillator adjustment is from 36.2Khz to 47KHz, allowing fine tuning for almost any appliance. 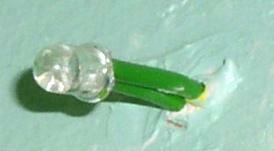 The final output stage uses a BC337 transistor in emitter follower. The output pulse will not be inverted, and the current through the IR photo emitters is around 30 mA dc. This is of course an average value, measured with a digital multimeter. The red led as always, is a visible indication that an input signal has been received. The circuit may be modified to use a fixed resistor in the timing chain as shown below. In this example a voltage regulator is also recommended to prevent changes in supply voltage altering the output pulse. An alternative output configuration is shown below. This uses a MOSFET to replace the original BC337 transistor. My thanks to Pete Griffiths for this modification and diagram. i Have made mark 4 Circuit for my Videocom D2H system, it works perfectly for 3 months, afterword it stop working, sometime works some suddenly, only for once then didn't.